My brother Ron had hoped to write his own account of his interesting career on the railways, and he retained a quantity of reports and records for the purpose. Unfortunately he did not manage to start the book, initially because of the range of useful activities he undertook during retirement, followed by several years of distressing disability, which he bore with great fortitude and patience. His store of technical records have been retained by his nephew by marriage, David Ward, and made available to the author for use in this excellent account of Ron's life, and to complement the wealth of personal reminiscences by family members and his colleagues during various stages of his career. Although he did not reach the heights he had always aimed for, he nevertheless had a significant influence on various matters in his own quiet, but persistent, way, and gained the respect of many of the leading railway engineering offieers in this country and also on the Continent. Most of his achievements have never been recorded for the public, apart from his name being widely associated with the rebuilding of the Bulleid Pacifies. Hence this book admirably fills the void, and describes his unique experiences with the gestation of the London, Midland & Scottish Railway (LMS) articulated 3-car diesel train; supervising the assembly of Stanier class '8F' 2-8-0s at Sivas on the wild Anatolian Highlands of Turkey; the arduous Machine Tool Mission to India in 1944 led by Sir William Stanier; together with plenty of more routine matters such as the design of several of the British Railways (BR) standard steam classes, plus electric and electro-diesel locomotives on the Southern Region, and finally the design of the mechanical parts of the prototype High Speed train (HST). Despite his lifelong interest in steam locomotives of all periods and pedigrees, he gave his full concentration to the development of newer forms of traction. He also strove hard for the preservation of really historic locomotives, drawings and photographs, etc., so it was natural for him to take on, virtually single-handed, his coach restoration projects for the Festiniog Railway. Needless to say, he was a wonderful brother to me. Despite a 10 year age difference, he was always a real companion, whom I admired even as a toddler. Apart from his academic achievements, he was an outstanding craftsman with tools and instruments of all sorts. He encouraged me to share in his activities in model railways and photography, and patiently, but firmly, instructed me how to achieve higher quality in my handiwork as well as behaviour. Whilst the story cannot be first-hand, the author has compiled an excellent review of Ron's life and career, which gives great satisfaction to our family and, hopefully, to the readers. I am delighted to have been invited by the author to write this Foreword. Born 5 November 1911 in Harpenden and was educated at St George's School thereat, before becoming a priviledged apprentice at Derby Works.and died in Llandudno on 2 September 1994. Ron Jarvis had a very interesting life and railway career which included working with Tommy Hornbuckle on the Stanier three-car DMU, the preparation of 8F locomotives for service during WW2. He had served his apprenticeship at Derby under H.G. Ivatt at same time as H.A.V. Bulleid. Formerly Chief Technical Assistant at Derby (he represented the LMR on the committee which investigated the output from the Interchange trials of 1948 and represented Southern Region (Brighton Works) on team which designed British Railways Standard locomotives. His input was greatest on the class 4 2-6-4T and class 4 4-6-0 designs, although he was involved in designing the 9F and the Franco-Costi boiler variant. He was also responsible for the re-design of the "rebuilt" Merchant Navy class and Bulleid light Pacifics. He also modified the front-end of the Maunsell 2-6-0s. He was deeply involved in th preservation of railway records, especially those at Derby, and worked as a volunteer on the Festiniog Railway. He is buried in St. Peter's in Llanbedr (Humm J. Rly Canal Hist. Soc., 2015, 38, 252). The Chackfield biography is excellent although it does not appear (not in index) cover his work on exhaust steam injectors acknowledged by Metcalfe page 117..
Chackfield, J.E. 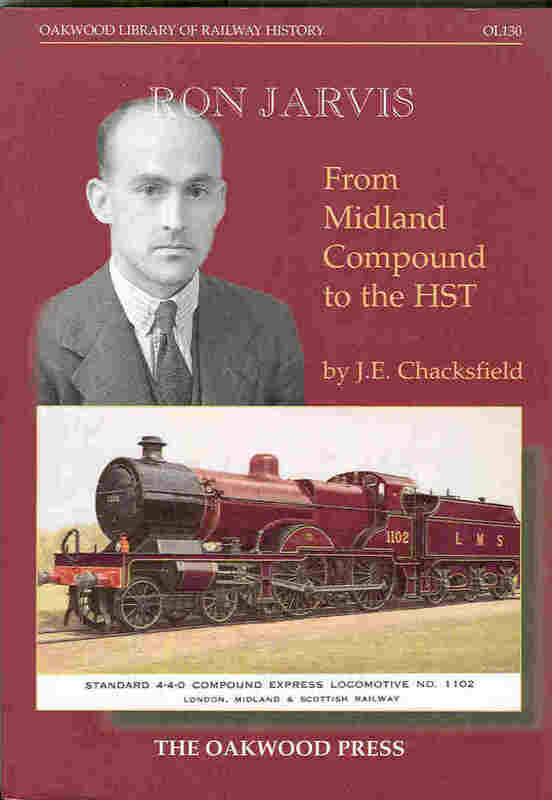 Ron Jarvis: from Midland Compound to the HST. 2004. Excellent biography which includes Jarvis's involvement (Chapter 3) in assembling 8F locomotives in neutral Turkey during WW2 and in the receipt of them at the port of Iskenderun. Chapter 6 reccounts the return of 8Fs from the Canal Zone to the LMS following WW2. Formerly with English Electric (Cox: Locomotive panorama 1). He developed the mobile testing units (essentially electrical generators) with dynamometer car following the work of Prof. Nordmann of the Reichsbahn. Rimmer shows that Andrews could be oblivious to railway operating requirements.Wise noted his railway experience gained in the USA..
1. An investigation into the heat transfer of various air cooled tubes. 2. The application of the preceding thesis to the design of condensers for locomotives. MSc 1931. The development of instruments for measuring the performance of steam locomotives with the mobile testing plant. Trans. Soc. Instrum. Technol., 1957, 9, 45-60. Disc. : 60-1.16 illus., 10 diagrs., plan. Bibliog. Tests of one of the class on the mobile test plant. The mobile testing plant of the London, Midland and Scottish Railway. Proc. Instn. mech. Engrs., 1948, 158, 450-63. Disc. : 463-76+ 6 plates, 22 illus., 14 diagrs., 2 plans, table. Bibliog. Stresses in locomotive coupling and connecting rods. J. Instn Loco Engrs, 1952, 42, 533-603 (Paper 517). The design of both coupling and connecting rods is complicated by the considerable inertia forces to which they may be subjected while working, and as speeds and loads continually increase, designs are tending toward the critical, and it therefore becomes increasingly important, both that the working of such rods is fully understood, and that the loads to which they are subjected in service should be ascertained. A theoretical paper with 21 citations to other research on stress. Sanford, D.W. The relationship between smokebox and boiler proportions. J. Instn Loco. Engrs., 1944, 34, 40-53. Disc. : 53-76. 5 diagrs., 2 tables(Paper 451). Andrews.. (55-6) commented upon smokebox efficiency and its measurement. Was involved in low speed tests with the mobile testing unit on the London Transport Wimbledon branch: see page 53. Born in Harpenden in 1922, died in Luton on 21 August 2012. Jim was the younger brother by ten years of Ron Jarvis who was Mechanical Engineer (Design) for British Railways. Their father was the founder of the building company Jarvis which has undertaken some civil contracts with Network Rail. Jim worked for the LMS and later BR on locomotive design and development and his qualifications included an M.Sc from Illinois University awarded after a two year scholarship which involved working in the Roanoke Works of the Norfolk and Western RR. In particular Jim was proud of having devised the dynamic balancing for the Standard 9F 2-10-0s (material on Internet, but source not given), using principles he had learnt in North America. He also visited Canada and his photographs of Toronto and Montreal taken in 1952 have been published by the Modellers of North America. Jim was in the forefront of modern-day railway photography, as early as the 1930s going linesiding in Scandinavia and making a steam tour of South Africa (as he liked to recall, the Knysna branch was Class 7 4-8-0s in those days) with an older brother. He was quickly into 35mm colour and brought back many excellent pictures of North American steam from his university stint in the USA in the fifties. Jim travelled widely in search of steam. He loved northern Italy and published some of his pictures of the Val Gardena line privately. He had wonderful photos of Spanish trains great and small taken on a number of trips with Peter Gray, John Dewing and others when the going was good in the 1960s. Jim Jarvis was a stalwart member of the Continental Railway Circle and was a familiar figure on organised rail tours: Lawrence Marshall's 'Great Indian Train Journeys' were a favourite of his. Assume that wonderful Dufay Colour image of malachite green J2 4-6-2T No. 3236 on final page of Hugh Ballantyne's Southern steam in colour was taken by him, also wonderful photographs of trains on Mallaig extension taken in March 1956 Scottish steam in colour and elsewhere. Fire precautions in locomotives and rolling stock. Rly Div. J., 1971, 2, 94-126. Disc: 127-62. 9 illus., 6 diagrs.